An American-Islamic advocacy group is calling for an FBI hate crime probe after a shot was fired at one of the largest mosques in the Chicago area Tuesday morning, disrupting service as some 40 worshipers were inside. 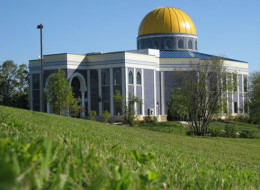 A single bullet penetrated the dome of the suburban Orland Park Prayer Center (OPPC) around 6:05 a.m. Monday during the Fajr, or break-of-dawn prayer, causing debris to fall and disrupt the service, according to a statement from the Chicago office of the Council on American-Islamic Relations. No one was injured. "Had it been aimed lower and gone through a window, I personally believe it could have killed someone, if not injured them very seriously. So that is not lost of anyone and is much cause for concern, and fear, really," CAIR-Chicago executive director Ahmed Rehab told WGN (embedded). Orland Park police responded to the scene where police Lt. Tony Farrell told the Tribune they had yet to find anyclues indicating why the mosque was shot at, only confirming there was "criminal damage." The incident is not yet being investigated as a bias crime -- the category that covers hate crimes -- since intent hasn't been established, according to Al Jazeera. As CAIR and mosque officials appeal to the FBI to look into the incident as a hate crime, Orland Park police have increased patrols around the OPPC, ABC Chicago reports. The mosque, which reportedly received hate mail in the past, has also stepped up its own security as the investigation continues. WGN notes the OPPC incident comes just a day after Nazi and Ku Klux Klan fliers were placed on cars in a parking lot of a nearby shopping center. ACTION ALERT: Anti-Boycott Resolution to be voted on today! Your voice needs to be heard!